An investigation has been opened to our Co-chairman Merve Arkun, by Diyarbakır Office of the Chief Prosecution, due to the activities which were held on the 15th of May, The International Day for Consencious Objectors. We had organised two-day activities on the 15th of May in 2016, and throughout the activities; we had organised a press release and declarations of conscientious objection in front of Tahir Elçi city forest, with the title “We Do not Let Amed to Become a Garrison Town”. Bearing in mind the scandalous fact that despite numerous appeals, Greek authorities have, for several decades, violated the human right of conscientious objection to military service, the European Bureau for Conscientious Objection and War Resisters’ International support the renewed call for a boycott of the Conscience Examination Committee (the special advisory committee which examines applications for conscientious objector status), which has been issued by the Association of Greek Conscientious Objectors. Twelve years after the groundbreaking judgement of the European Court of Human Rights in favour of the Turkish conscientious objector Osman Murat Ülke the Turkish government continues to deny the comprehensive implementation of the mentioned ruling. Until now neither the individual nor the general legislative measures requested by the judgement have been fully executed: In November 2017 Ülke’s case has been reopened by the Prosecutor in Bilecik, and there is still no provision in Turkish law that would guarantee the human right of conscientious objection to military service. Yannis-Vasilis Yaylali is a peace activist and journalist in Turkey, jailed by the Turkish government since April 22nd of 2017. He is a Turkish citizen of Greek origin born in the Bafra area of the Black Sea coast. Mr Friedhelm Schneider from the European Bureau for Conscientious Objection (EBCO) sent the statement below about Yannis-Vasilis Yaylali and Meral Geylani. Le Bureau européen pour l’objection de conscience (EBCO) présente son Rapport annuel 2017 sur l’objection de conscience au service militaire en Europe, à l’occasion de la Journée internationale des droits humains (10 décembre). In view of the International Human Rights Day (December 10th) the European Bureau for Conscientious Objection (EBCO) publishes its new Annual Report “Conscientious Objection to Military Service in Europe 2017”. Le Bureau européen pour l’objection de conscience (EBCO) a tenu son assemblée générale 2017 le 4 novembre au Centre multimedia communautaire chypriote, dans la zone tampon de l’ONU entre les deux parties de Nicosie, la dernière capitale divisée d’Europe. 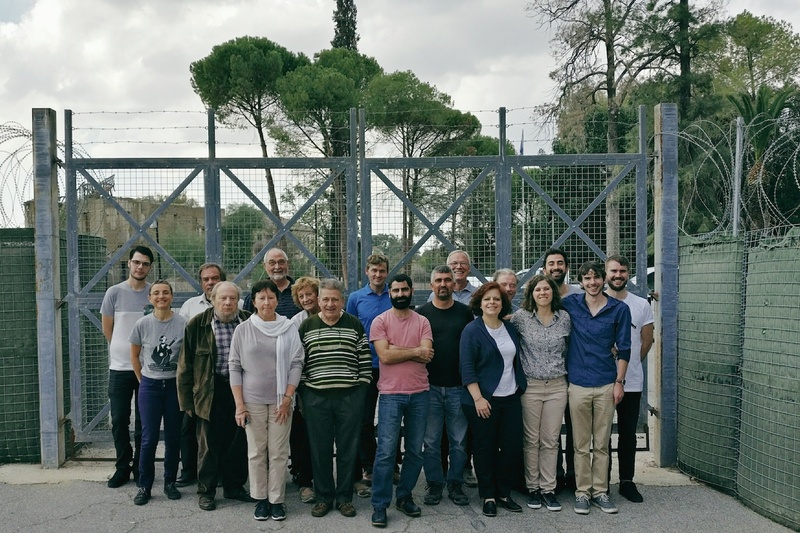 The 2017 General Assembly of the European Bureau for Conscientious Objection (EBCO) was held on 4th November in the Cyprus Community Media Centre (CCMC) in the UN buffer zone between the two parts of Nicosia, the last divided capital in Europe, in Cyprus. We are happy to present You the following album prepared by the National Assembly of Youth Organizations of the Republic of Azerbaijan in the frame of “July 22nd – European Action Day in Support of Victims of Hate Crime” of youth campaign of the Council of Europe - No Hate Speech Movement in memory of Zakhra Guliyeva, the 2 years old victim of hate crime and all the children hurt and killed during armed troop attacks. The European Bureau for Conscientious Objection expresses its indignation for the forthcoming trial of Panagiotis Makris by the 3-membered Military Court of Thessaloniki on Thursday, June 1st, for an offence of “insubordination” since 1990! Το Ευρωπαϊκό Γραφείο για την Αντίρρηση Συνείδησης (EBCO), με την ευκαιρία της ανοιξιάτικης Γενικής του Συνέλευσης, υπενθυμίζει τις υποσχέσεις της ελληνικής κυβέρνησης για αντιμετώπιση των προβλημάτων στη νομοθεσία και τις διαδικασίες σχετικά με την αντίρρηση συνείδησης στην στρατιωτική θητεία, και προσφέρει τη βοήθειά του. The European Bureau for Conscientious Objection (EBCO), on the occasion of its spring General Assembly, recalls promises by the Greek Government to address shortcomings in its legislation and procedures regarding conscientious objection to military service, and offers its assistance. An anti-military march of Greek and Turkish Cypriots broke into the buffer zone in the old town of Nicosia on Saturday demanding the reunification and demilitarisation of Cyprus. Some 100 protesters marched from Sarai Square in northern Nicosia, through the Ledra Street crossing before breaking through a gate and walking into the buffer zone in the old town.